Congratulations to Herm Sorcher and the staff at the Danbury Whalers who had their first player called up to the AHL. Danbury, CT – Today, at the Danbury Ice Arena, Danbury Whalers, Head Coach / Director of Hockey Operations, Chris Firriolo, announced that the New York Islanders top farm team, the Bridgeport Sound Tigers of the American Hockey League, have called up Danbury Whalers Right Wing #27, Mike Sellitto. Sellitto played in the American Collegiate Hockey Association for Florida Gulf Coast University from 2007 to 2010. 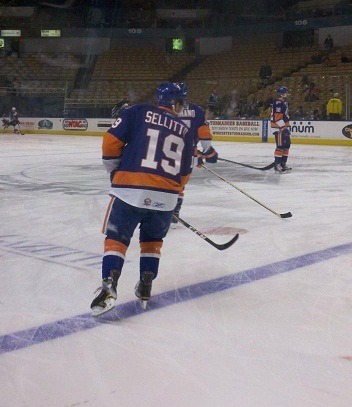 Sellitto came to Danbury from the Louisiana IceGators this season and played just two games before being called up to the Sound Tigers. The Sounds Tigers are on the road tonight against the Worcester Sharks at 7 pm. The Danbury Whalers are home on New Years Night 1/1/11 at 6:05 PM against the Rome Frenzy. Following the game catch the UCONN vs. Oklahoma Fiesta Bowl at the TK’s American Café in Danbury for the post game party. This entry was posted in AHL, Danbury Whalers, ECHL, Federal Hockey League, Hockey, Sports and tagged American Collegiate Hockey Association, American Hockey League, Bridgeport Sound Tigers, Danbury Connecticut, Danbury Ice Arena, Danbury Whalers, Florida Gulf Coast University, Herm Sorcher, Mike Sellitto, New York Islanders. Bookmark the permalink.